Sony TC-K71 3-Head Cassette Deck Serviced & Replaced All Belts!!! Was missing the three head decal badge. So I replaced with a black plastic cover. See picture with the cassette door. But not apparent when song is playing. Just wanted to point this out. Sony TC-K71 3-Head Cassette Deck. 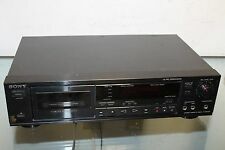 Sony TC-FX170 Single Cassette Player Recorder Stereo Deck will need new belts. • 2 Head Design. • Record Protection. • Headphones. • Alternating Current. • Auto Shutoff. • Black Finish. I have owned this deck for several years. I had always used Maxell UDXLII tapes but a few years ago I tried a Maxell MX-S tape in it. I had no idea how good this thing could sound. The difference was HUGE! Very rare Sony TC-K909ES 3 head stereo cassette deck. All functions working when tested. Type: 3-head, single compact cassette deck. Input: 160mV (line). Output: 0.5V (line). Total Harmonic Distortion: 1.3%. SONY STEREO CASSETTE TAPE DECK TC-FX211 SERVICED TESTED. Manual tape selector. Analog Tape Counter. High Density Head. Color : Black. Headphone Jack. What you see is what you get. Check item condition above. SONY TC-K501R 2-Head Tape Deck Needs a New Belt. Up for sale is a Sony TC-FX170 Stereo Cassette Deck. Super dope vintage tech. Would make a really cool addition to anyone’s listening needs. The item does work and is in great condition for its age. Will ship once payment is received. Thanks for shopping! Sony TC-FX170 Single Cassette Player Recorder Stereo Deck. Condition is Used. Minimal cosmetic wear on top from use. NO EXTRAS, only what is pictured is included. Trending at $39.33eBay determines this price through a machine learned model of the product's sale prices within the last 90 days. Sony TC-RX50ES Cassette Deck And Manual. In working condition manual has writing on it. Sony TC- K555ES Pro. Stereo Cassette Deck. Type: 3-head, single compact cassette deck. Total Harmonic Distortion: 0.8%. Output: 0.435V (line). Input: 77.5mV (line). Wow and Flutter: 0.04%. Signal to Noise Ratio: 73dB (dolby C). Everything is in tact on this door. Even has the original Sony hype sticker on it still. The deck wasn't working. So, I managed to save the door from being dumped in the trash. You'll get exactly what's pictured. Sony cassette deck SONY TC-KA3ES Black. Overview of Deck It is a fully operational item that carried out maintenance. Both playback and recording are very good in all tapes (Type I, II, IV). Cassette deck corresponding to the basic model of the new ES series. Operation check is completed. Cassette deck developed as a new reference deck. Operation check is completed. A cassette deck corresponding to the basic model of the new ES series which was developed with the introduction of advanced technology technology. PC - OCC winding laser amorphous head adopting high purity oxygen free copper PC - OCC for winding of laser amorphous head is adopted. Trending at $502.33eBay determines this price through a machine learned model of the product's sale prices within the last 90 days. Here we have a Vintage SONY TC-FX25 Stereo Cassette Deck Tape Player. It has been tested and plays, however fast forward and rewind do not work. This will need repair. SOLD AS IS. Will be shipped within 1 business day of payment, check out my store for other great deals! Thanks! The unit powers on and the display lights up but the door to the cassette holder won't open. Sony TC-K670 3- Head Stereo Cassette Deck. Made in Japan. THIS DECK HAS JUST HAD A NEW BELT INSTALLED AND BEEN CLEANED. THE DECK ONLY PLAYS PROPERLY IN THE LEFT ARROW DIRECTION. FAST FORWARD AND REWIND WORK IN BOTH DIRECTIONS. It is tested for play, rewind and fast forward functions only. For parts and repair only. Unit powers on but will not play cassette. Sold as-is. CONDITION: ESTATE FIND, I have no speakers to test sound, but it powers on, the fast forward and reverse work great. All button commands seem to work great. Cassette deck open and closes fine, it just seems a tad loose and doesn't always sit flush with the rest of the unit. Fast-forward function is not working on cassette and when playing sound output is slowed down. Exact item as pictured. Ultra-rare tape deck. The tape deck was tested. In the left play option it sounds excellent, the speed sounds good as well but when you play to the right, it still plays but it sounds a bit muffled. Sony TC-FX25 Tape Deck Repair Parts Only. Decent condition, scuffs on top of case, face a little worn. Plugged in and powers on, however tape deck wont accept a tape. Refer to pictures for exact item you'll be receiving. The unit will power on. If you put a cassette in, the door will not close. I was unable to test any of the other functions. The player has been tested and the play function on this unit does not work properly. From the research found on youtube it appears that this is a common issue where the heads need to be adjusted. The unit DOES power up. NO further tests were done on this unit. Most of the units sold in the US are designed for 110-120 V and if you apply 220V to the system, it WILL burn it. If you are willing to take a chance, you might just end up with a nice unit at dirt cheap price. Sony TC-V7 Stereo Cassette Deck Player. Powers on, eject and closes no problem. Stuck in play mode. I have shown the condition as best I can on the photos. This also applies to combined orders. No exceptions can be made. One of the big advantages of cassette audio was the way you could not only make your own tapes but also take them anywhere. You could play them at home, on the go, or even in your car. Ferric Oxide: Type I features good bass response but does not handle treble as well. This makes them suitable for heavy music with a lot of bass but not as good for something like a soprano solo. Chrome: Type II adds chrome to the chemistry and swaps out bass fidelity for treble. This kind of tape is better for the soprano than the bass line. Metal: Type IV uses metal oxides for higher fidelity reproduction on all levels. It's the closest to CD quality that cassette tape can get. What Kinds of Features do Decks Have? Wells: Some decks feature dual wells, so you can dub from one cassette to another. They work well for copying but unless you're intending to do a lot of dubbing you may be better off with a something like a Sony single well deck. Some manufacturers even restrict some advanced features to single-well decks. Audio: Audio quality comes in various forms, but at the very least you should consider noise reduction if not pitch control. Better tapes and decks also feature better frequency response to put more fidelity in your Hi-Fi. Convenience: Auto reverse removes the need to flip the tape after side one, while a remote control lets you manage your tape deck from the convenience of the couch. The first step to any kind of listening experience is knowing the quality of the recording. This is particularly important with media like cassette tapes where the quality of the medium makes a noticeable difference to the experience. A good Sony cassette deck aims to bring out all it can in a recording. All you have to do is press play.